I've been to Wang Thai a couple of times in the last year or so, and despite the place being almost completely empty when I visit, they still seem to be soldiering on delivering some interesting dishes. Their set lunch menus are fairly reasonable by Itaewon standards. Ranging from 15,000 to 20,000 won per person, you get two courses plus dessert and tea/coffee thrown in. Last time my wife and I ended up at Wang Thai we settled on Set Thai Lunch A for 20,000 won. To start, Tom Yam Gung, followed by Nuea Pad Bai Kraprao. 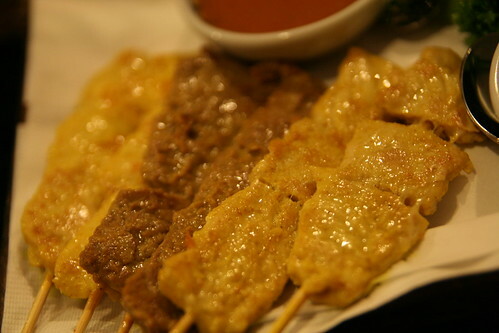 We also ordered the Satay Ruam for 10,000 won and the Gaeng Peth Pet-yang for 15,000 won. 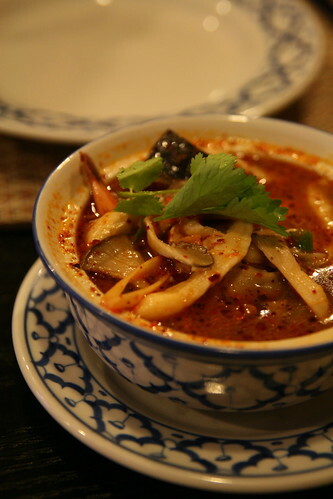 The Tom Yam Gung, Thailand's famed hot and sour soup came out first, chockablock with prawns, mushrooms and other goodies. It's delicious and my wife demands it every time we come, but to be honest it's a little too full on for me. Whenever it comes to the table, I hear Johnny Cash singing Ring of Fire in the back of my head and despite its temptations I stay well away. 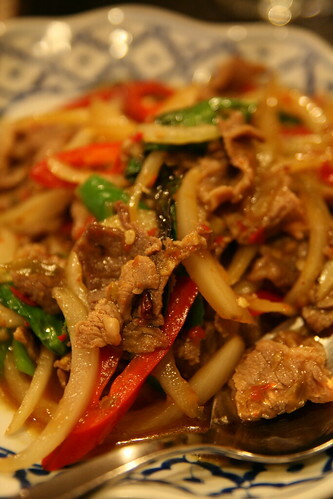 Next, the Nuea Pad Bai Kraprao: stir fried beef with basil leaves, chillies and garlic. Simple, yet effective. Pleasantly hot without being overpowering, though it could have done with a little more basil. 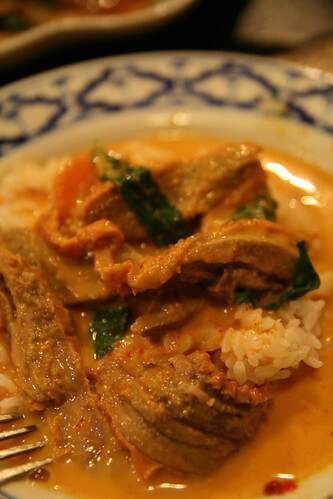 Finally, the Gaeng Peth Pet-yang came out (Roasted duck in red curry with pineapple and vegetables). I've always been curious about roast duck curries, but I'm not sure that I'll bother with them again. I adore our quacking cousins, but this sliced waterfowl ended up being a little bit too chewy. Any crispiness of the skin had been lost after its time in the sauce and while vaguely pleasant, it wasn't the incredible culinary experience I hoped it to be. Service is always good and they were very happy to provide an extra dessert (Tapioca balls in coconut milk) despite us only ordering one set menu. I'll go back to satisfy my wife's hot and sour cravings, but it's certainly not top of my list of eateries to visit. If you fancy trying Wang Thai then head out of Itaewon station towards Noksapyeong. Wang Thai is in the same large brick building as What The Book, on the third floor. You can call them on 02 749 2746 or visit their website here.